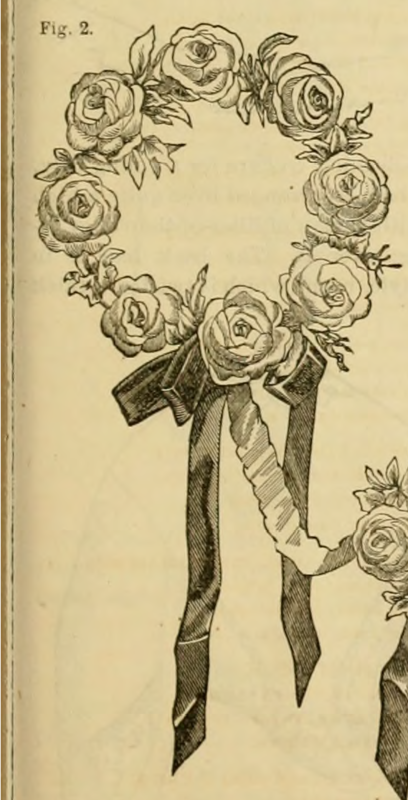 A quick look at fashion plates of the 1860s shows that whenever a formal gown was worn, a lady would nearly always wear some ornament in her hair. There were numerous illustrations of this ornamentation in the ladies magazines of the day, ranging from jewels to laces to flowers and more. Not only did the ladies love to put all sorts of ornaments in their hair, they would also try to create elaborate hairstyles using all sorts of hairpieces to make their own hair look more impressive. No, all of those amazing hairstyles that you see in the vintage magazines were not solely the lady’s real hair! False hair pieces to enhance one’s appearance were quite acceptable. However, in considering the modern reenactress and her limitations in hair styling for formal events, I have assumed that most of us don’t have the time or perhaps money to invest in numerous hairpieces to add to our tresses. I have, therefore, chosen several of the simpler illustrations as my inspirations for the ladies of today when creating my headdresses. At this point, it has seemed most practical - and lovely! 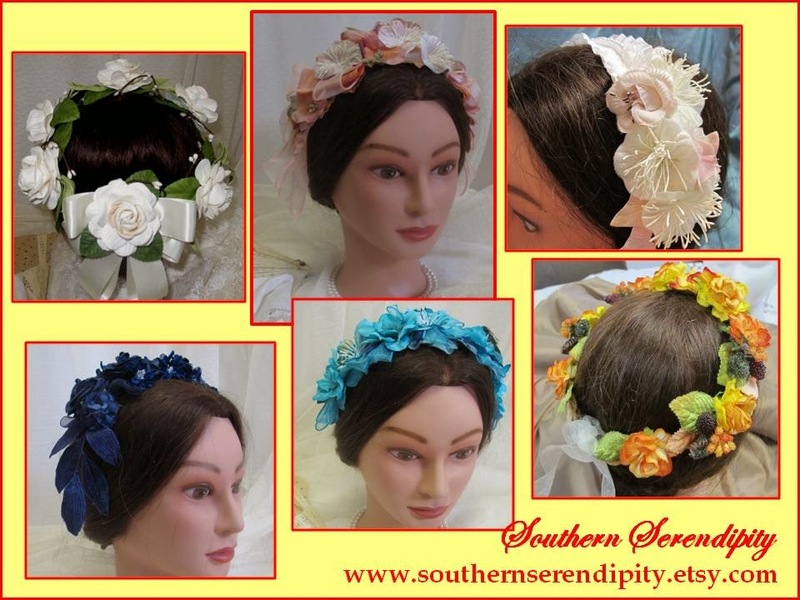 - to use the simple crescent and wreath styles to help ladies achieve the 1860s look for their events. 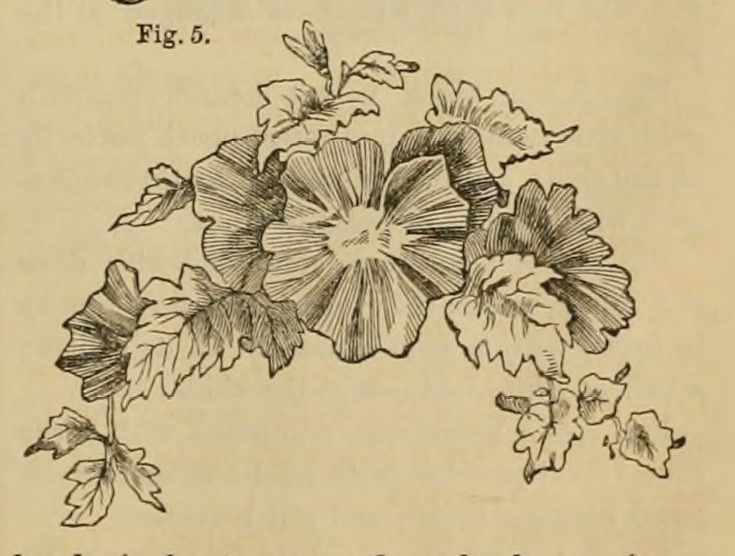 Both of these line drawings are from Godey’s Ladies Book, April 1864. Below are photos of headdresses that I have made for my shop based on the crescent and wreath styles.